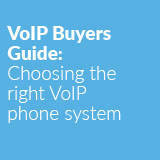 Onsite phone systems are expensive to maintain and their restrictions may not fit with your business needs. If you are looking to move your phone systems to the cloud, it is crucial to map business and functional requirements to the solutions available. Moving to the cloud should not only be a financial no brainer but also deliver better technology to your users driving greater efficiencies in your workforce. The aim of this buyer’s guide is to provide essential information and useful tips to consider before making your decision.